Erlangen, October 22, 2018 - With the presentation of Mobilett Elara Max, Siemens Healthineers is setting new standards in mobile X-ray imaging. The easy-to-clean system surfaces with an antimicrobial coating reduce the risk of hospital acquired infections. A comprehensive IT security concept protects sensitive patient data and the secure integration of Mobilett Elara Max into the hospital’s IT environment provides access to all relevant data at any time. Thanks to the smooth maneuverability and flexible positioning of the X-ray arm, the system facilitates easy access to the patient and optimizes workflows in radiology, thus increasing efficiency. Through its consistently high image quality, it provides diagnostic confidence directly at the patient’s bedside. Mobile X-ray imaging is particularly important for patients who cannot move and go to a radiology department. Thus, the intensive care unit is the main area of application. In addition, there are numerous further use cases, ranging from broken legs to lung diseases, from neonates through to trauma patients. Due to these flexibility benefits, the demand for mobile X-ray systems has been increasing during the past few years. But mobile X-ray machines, which are used in a variety of rooms in numerous clinical situations, particularly represent an increased risk for the spread of germs. Protecting patients from infections is thus a decisive factor in ensuring high quality health care. One in ten patients worldwide is affected by hospital acquired infections contracted during a stay in hospital. In the USA, more patients die from hospital germs than from AIDS, car accidents and breast cancer combined. As pathogenic germs may survive on surfaces for weeks and months, the Mobilett Elara Max is equipped with an antimicrobial surface. This significantly reduces the number of microorganisms on the system surface. The cleaning of the new mobile X-ray machine has also been significantly simplified through an innovative device design: Closed surfaces, reduced gap dimensions and fully integrated cables make system cleaning easy. Thus, the Mobilett Elara Max helps minimize the risk of infections. The numerous locations, where mobile X-ray systems are used, require seamless, but nevertheless secure integration into the hospital’s existing IT infrastructure. The Mobilett Elara Max is therefore equipped with a comprehensive cybersecurity package, which helps withstand digital threads. Furthermore, virtual workstation technology enables the user to install additional hospital software on the Mobilett Elara Max, thus obtaining access to all the necessary information directly at the patient’s bedside without affecting the safety of the X-ray machine. 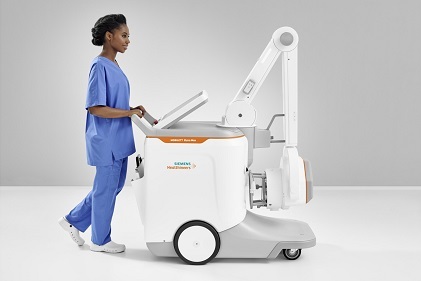 As part of the Max product family from Siemens Healthineers, Mobilett Elara Max benefits from the advantages provided by a standardized technology platform, ranging from radiography to fluoroscopy through to mobile X-ray imaging. This allows the standardization of workflows across diverse examinations. Through the common use of detectors for different platform systems, you can achieve considerable savings using Max X-ray systems. Identical user interfaces shorten the training period, reduce the number of errors and increase efficiency.